While serving on the protection detail for the Queen of England when she comes to visit Los Angeles, Lieutenant Frank Drebin (Leslie Nielsen) of Police Squad stumbles across a conspiracy to assassinate the monarch. “The Naked Gun” is a spoof of detective films and crime noirs. As such, it pokes fun at the clichés and tropes of those genres in a number of outlandish, ridiculous and downright brilliant ways. Not only that, but the film demands that the viewer pay constant attention because there are countless gags and jokes that could be missed if one stops paying attention for even a second. This is part of what helps “The Naked Gun” stand out as not just a fantastic spoof movie, but also as one of the all-time great comedy films. Within a span of 10 seconds, there could be multiple jokes, whether they be verbal, sight gags or something else entirely. It is done at the perfect pace so that if a joke falls flat, the audience is not waiting a long time for the next laugh, but they are spaced out enough so that once the audience is done laughing at one gag they can move on to the next one. The latter is much more likely because every single joke hits the mark perfectly. That being said, any good comedy needs a story around it to keep the jokes flowing and the audience invested, and “The Naked Gun” does this perfectly. The film plays out like a typical police film: officer is put on case, screws up, gets taken off and then has to save the day and solve the case in the end. It is a typical and cliché frame for a story, sure, but that is what is used to hang all of the jokes and gag from, and the comedic tone gives an original spin to the plot. The movie also makes sure to include an emotional core to the film and give the audience something to route for. In the case of “The Naked Gun,” it is the blossoming and surprisingly touching romance between Drebin and the main antagonist’s secretary, Jane Spencer (Priscilla Presley). What really helps to sell everything in “The Naked Gun” is the star. Before “The Naked Gun,” Leslie Nielsen left an impression of his comedic abilities for his role in “Airplane!” as Dr. Rumack. Before that, though, Nielsen was predominantly a dramatic actor, and he brings those abilities to this role. He delivers every line straight, which just serves to boost the comedic impact of the jokes, and his no-nonsense approach to the role and character makes him stand out from other comedic actors of the time. While Nielsen is great in the movie, he is not the only one who stands out. The other prominent actors in the film, Priscilla Presley, George Kennedy, Ricardo Montalban and O.J. Simpson, all bring their A-game and create some memorable moments and gags along the way. 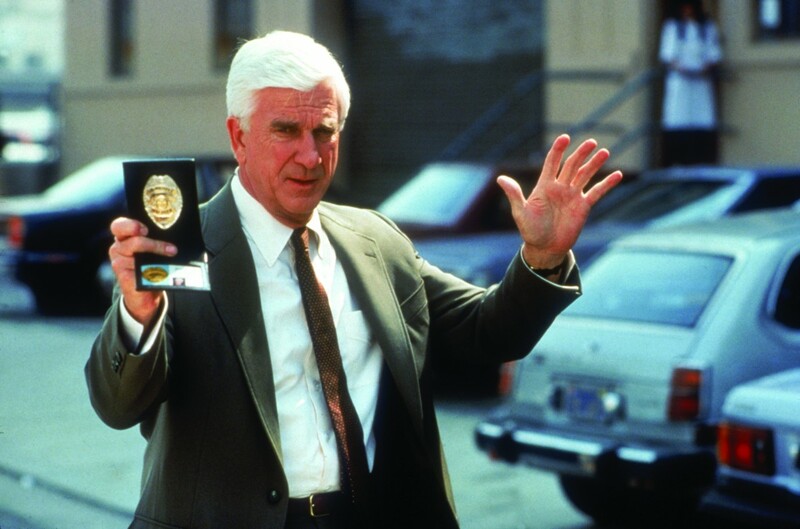 “The Naked Gun” could have easily fallen apart because of Drebin’s character, but fortunately the Zucker Brothers knew how to handle a character like this. Drebin is the bumbling comedic cop who gets himself into wacky hijinks. However, the audience can believe that a character like this could be a police officer, even a lieutenant like Drebin is, because he showcases skill and credibility with the job, despite his idiosyncrasies.